Eddy Merckx, a name which everyone in cycling knows, the hard Belgian who won Grand Tours for fun and made everyone else look like amateurs. On top of his ability on the bike after his retirement Mr. Merckx carried on his good name by creating beautiful steel frames that were provided to teams in the peloton. These classic steel frames can be worth a fortune today, if in good condition and of the right era. Imagine my disbelieve when I go to take the rubbish out of my East London flat and there, in front of me is an Eddy Merckx bike. Sitting there a little bit worse for wear desperate for some TLC. No quicker was the rubbish thrown out, the bike was back up on my balcony looking a bit happier to be in the sunshine. I couldn’t believe my luck. 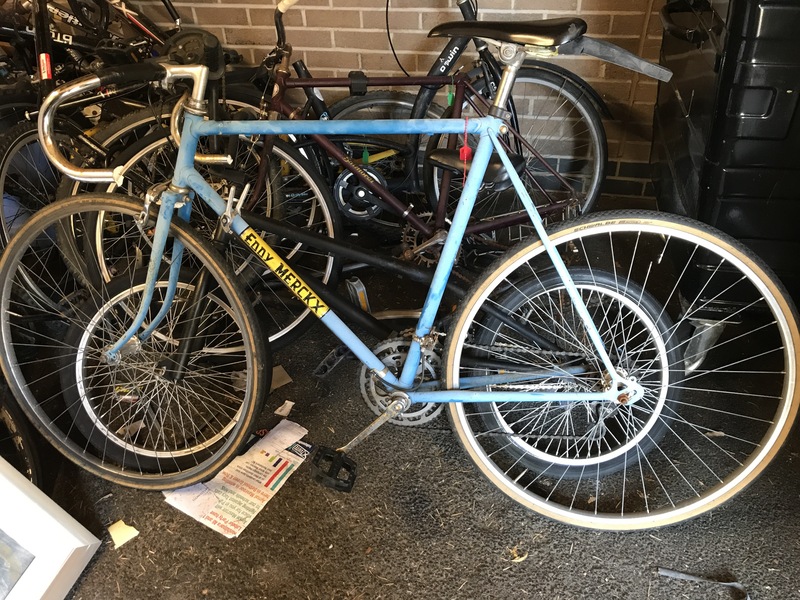 A Merckx frame and it’s just begging to be restored. Lucky me. Frame numbers are on the bottom brackets of a Merckx bike, I found a really useful website that would allow me to see which classic Merckx I had. Wonderful. However, the frame number on this Merckx didn’t match. ‘What’s going on here?’ I thought, is this some sort of super rare Merckx? A bit of history for you – in the 1970’s Eddy wanted to cash in on his name, he wanted to produce more bikes than his factory could. To facilitate this along came British bike manufacturer, Falcon. In February 1973 they released a series of frames which were ‘approved’ by Eddy Merckx, each bike sold a lump of money would go to Eddy for allowing the bike to carry his name and Falcon would get the rest, good for the goose and the gander. What was the case though is that a lot of these frames were cheap, build them quickly and cheaply, sell them for as much mark up as possible to cash in on the Merckx name. The steel was of a lower quality, it was heavy and the only thing that made this bike a Merckx, not a Falcon, was the decals which were stuck on the bike. What I had sat on my balcony was a Falcon. A sheep in wolfs skin. A Falcon in Eagle feathers. I had been duped. Enthusiasm knocked and feeling slightly subdued I wondered what to do. I could just take the bike back down to the bin store, no harm done, leave it there for the next person to be passionate about it. Then I realised – this is still a bike, an awesome commuting bike. A bike I could still do up and be proud of. It actually has its own little interesting story. People still buy knock off Piccasso’s thinking they’re the real thing, right? 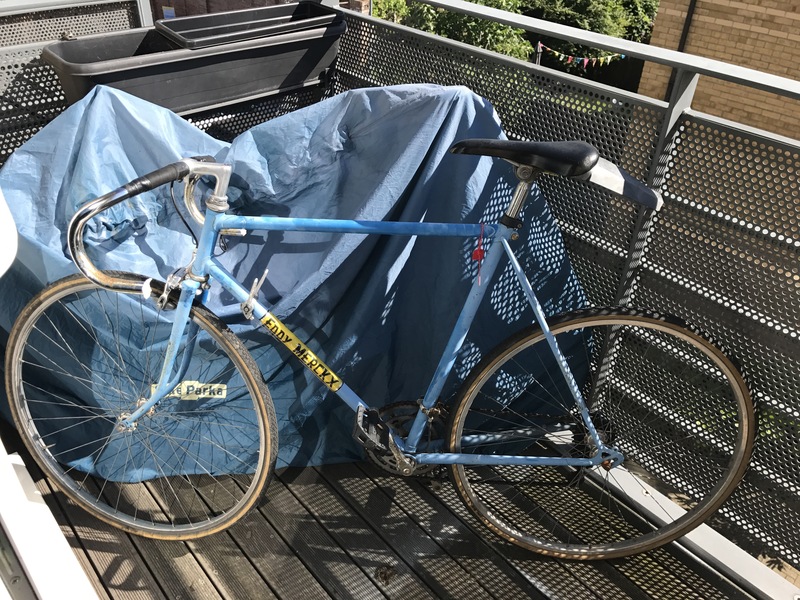 So – over the next few weeks / months I’m going to be turning this slightly rusted, Merckx approved frame in to something I can be proud of and you dear reader can follow the story here. Right from getting the parts to its first finished ride! I’d love to hear your thoughts, comments and ideas as the restoration progresses and of the whole idea! So tweet me, comment on Instagram, comment, like and share on Facebook and also below.